The main park Visitor Center at the base of the road up to Hurricane Ridge is an ideal starting point for getting the most out of the 17-mile drive up to the ridge. 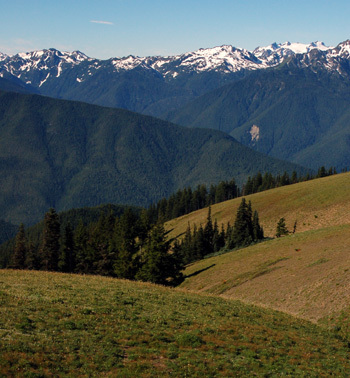 The road traverses a complex series of life zones, from a stand of old-growth conifer forest at Heart of the Hills Campground (just beyond the entrance fee station), through montane forest, to subalpine parkland at Hurricane Ridge itself at over 5,200 feet, where stands of subalpine fir dot mountain meadows. Pullouts along the road offer birding, wildlife, wildflower, and scenic viewing opportunities that vary with the season. Lower elevations, such as Heart of the Hills Campground, support year-round populations of Varied Thrushes, Winter Wrens, and Gray Jays, and ring with the voices of Hammond's Flycatchers and Wilson's Warblers in the spring. Higher up, the forested slopes and mountain meadows are home to resident Blue Grouse, Pine Siskin, Red Crossbill, Common Raven, Golden-crowned Kinglet, Red-breasted Nuthatch, and Chestnut-backed Chickadee, whereas summer visitors include Swainson's and Hermit Thrushes, Olive-sided Flycatcher, Western Tanager, Townsend's Warbler, Townsend's Solitaire, Vaux's Swift, and Band-tailed Pigeon. Red Crossbills and Evening Grosbeaks could turn up at any season, and the Northern Pygmy-Owl is uncommon but present at most elevations. At the summit, American Pipit may be flitting around the snow-line in summer. September hikes along the upper-elevation trails can be good for hawk-watching. Endemic plant and animal species include Flett's violet, Piper's bellflower, Olympic Mountain daisy, and Olympic marmot. July is the peak time for the extraordinary wildflower display along the roadside, with dozens of species to pore over. Look around the wet boulders at the start of the Switchback Trail for the common butterwort, a ''carnivorous'' plant with tiny insects dissolving in its basal leaves. Late spring until early fall is the best time to visit. From US Route 101 in Port Angeles, turn uphill on Race Street, which brings you shortly to the Visitor Center. Just above the Visitor Center, stay to the right at the ''Y'', which will lead you to the park entrance station and on up to a second Visitor Center at the top. There are restrooms at both visitor centers and a small food concession at the top.